The holiday season is in full swing which means tons of special events in Orange County this December 2016. Check out the list of events below and make your holiday season just a little bit brighter with a special festival, fun run, or other community event. The Sawdust festival grounds are transformed into a winter wonderland where 175 artists create, display and sell original creations over the course of five weekends. The Winter Fantasy offers the most unique holiday shopping in all of Southern California. Art media includes jewelry, clothing, fused and blown glass, ceramics, woodwork, forged metals, painting, photography, sculpture, clothing and textiles. Disneyland is more festive than ever with tons of special holiday foods, shows, and features throughout both parks this time of year. World of Color – Season of Light, Viva Navidad, Santa Clause, It’s a Small World Holiday lights, Christmas Fantasy Parade, special holiday fireworks, Jingle Cruise, Haunted Mansion Holiday and so much more. The outdoor ice rink has popped up at the Irvine Spectrum next to the Giant Wheel for the holiday season. Tickets can be purchased at the Ice Rink Box Office in Giant Wheel Court, $20 for rentals including skates, $16 if you bring your own skates. Check out the site for a complete schedule of skate times, open all week long. Santa Claus is coming to Irvine! Visit jolly ol’ Saint Nick at his Crystal Cove beach-inspired surf shack located in Carousel Court at Irvine Spectrum Center. In addition to the photo op, join the man in red for Cookies and Milk with Santa on Saturdays in December form 2PM-4PM. New this holiday season, the Edwards Courtyard at Irvine Spectrum will be home to a mesmerizing LED color-changing 50-foot holiday tree. Beautifully decorated during the day, the tree will come to life at night, dazzling guests every half hour between 5PM and 11PM with a choreographed light show set to holiday music. Kick off the holiday season at the 22nd Annual Nutcracker Christmas Tree Lighting and Holiday Shopping Village in Downtown Anaheim on Center Street Promenade. The event spans the entire length of Center Street Promenade, with the giant redwood Christmas tree anchoring the traffic circle at the west end. Throughout the day enjoy kids crafts, free snow play, free train rides, music, food fair, shopping, and free pictures with Santa. The day ends with the tree lighting ceremony from 6PM-7PM. Orange County’s newest Holiday Tradition is the Run For a Claus 5K and Kids 1 Mile Run/Walk benefiting Wounded Warrior Project, Toys For Tots, the Salvation Army and Kids Run the OC Foundation. All runners will receive a Santa Hat, Santa Beard, a finisher’s medal and a commemorative mug for coffee/hot cocoa after the race. With cookies, costumes, holiday music and decorations, this will be fun for the whole family, everyone is encouraged to dress up and participate! Want to taste test some holiday and winter ales? OC Brew Ho Ho is the place to do it with 80+ fine craft beers from your favorite local breweries. The event will include live music, pictures with Santa, and delicious food trucks. Over half of this great selection will be special seasonal brews. In addition to the four hours of unlimited 2 oz tastings from 12-4PM., the event will also include an unprecedented collection of craft beer and brewery merchandise as a part of their Craft Beer Expo that will run from 12-5PM. Location: California Pizza Kitchen Courtyard (Tustin side of The Market Place). Enjoy hockey-themed cookie decorating and play games including Shoot the Puck, Pine Cone Toss, and Shooting Hoops. Location: Edwards Theater Courtyard (Irvine side of The Market Place). Decorate Santa hats and Christmas stockings! Plus, play games including Shoot the Puck, Guess the Candy Canes, and Shooting Hoops. Location: Food Court Courtyard near Lowe’s (Irvine side of The Market Place). Enjoy Christmas-themed cookie decorating, candy cane decorating, and games including Shoot the Puck, Pine Cone Toss, and Shooting Hoops. Join Autism Speaks Orange County and over 8,500 autism advocates as they walk to raise money and awareness. It’s free to register but you can make an even bigger impact by recruiting family members, friends, and more to form a team and raise donations. The event will be held at Angel Stadium of Anaheim and all participants who raise $150 or more will receive a commemorative t-shirt on walk day. Wear a holiday-themed costume. Tie jingle bells to your shoelaces. Show off your ugly Christmas sweater. Complete a 5-kilometer run or walk with your team members, spreading smiles, good cheer and a winning spirit, and be a Champion in the Arthritis Foundation’s Jingle Bell Run. Held at the Laguna Niguel Regional Park, be a part of the one of the largest holiday themed 5K races, and join the movement to conquer arthritis. Whether you’re participating in the 5K, 10K, or kids run, the Renegade Santa Run is a blast! There will be costume contests and prizes for best running Santa, best holiday non-Santa, and best kids holiday costume. Plus the man in red will make an appearance as well so you can take advantage of a photo op with Santa! Held at Hicks Canyon Elementary School in Irvine, this race event is fun for the whole family and runners of any skill level. That’s right, it’s time again! The 10th Annual Newport Beach Santa Pub Crawl, brought to you by Future Leaders of Our Community, has been cleared by the Big Guy at the North Pole for Saturday, December 10th. Last year’s Newport Beach Santa Pub Crawl included 600+ Santas that raised over $13,000 for Project Access and their Spreading the Joy holiday program. Thank you! The funds raised this year will continue to make a BIG difference for those less fortunate over the holidays. Join over a million viewers as you watch beautifully decorated yachts, boats, kayaks and canoes sail along the harbor in the 108th Annual Newport Beach Christmas Boat Parade, hosted by the Commodores Club of the Newport Beach Chamber of Commerce. Opening night and closing night will include fireworks off the pier at 6:15PM. Don’t miss this classic SoCal Christmas tradition! Winter Fest will feature all the best things the season has to offer without leaving our sunny SoCal bubble. There will be ice tubing, a two million light walk-through show, ice skating, snow play with real snow blown in daily, nightly Christmas tree lighting ceremony, carnival rides, festive entertainment, seasonal eateries, visits with Santa and so much more. Breakfast with the jolly man himself! Santa will host a breakfast at Westminster Mall with a yummy breakfast, crafts and entertainment for the whole family. Reservations required and space is limited. Breakfast is free but spaces will fill up so make sure to go online and reserve your spot now. Your favorite Christmas Elf Buddy is coming to the stage in Elf The Broadway Musical. Coming to the Segerstrom Center for the Arts, this is the most festive way to spread Christmas cheer. The show features songs by Tony Award® nominees Matthew Sklar and Chad Beguelin (The Wedding Singer), with a book by Tony Award® winners Thomas Meehan (Annie, The Producers, Hairspray) and Bob Martin (The Drowsy Chaperone). Enter the dazzling world of Disney magic LIVE ON ICE! The show includes your favorite characters from tons of beloved Disney Movies including Frozen, The Little Mermaid, Cars, Toy Story and more. Get warmed up for the show and be your best with exclusive moves taught by the mouse that started it all at Mickey’s Dance-Along Pre-Show. From wheels to waves, icy wonderlands to infinity and beyond, your family’s favorite Disney moments come to life at Disney On Ice presents Worlds of Enchantment. If we missed your favorite event, leave a comment and tell us all about it! 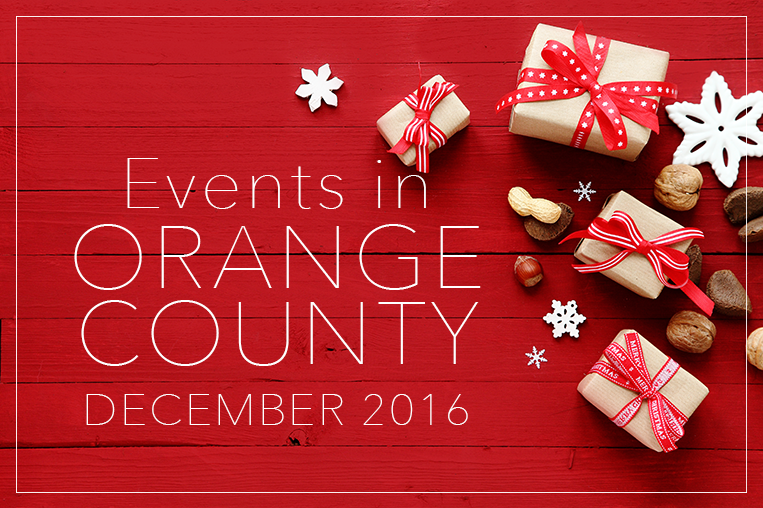 Include the time, date, and location of your December 2016 event in Orange County.